Crack-Ajax produced a new, custom theme, that focuses on the use of Landing Pages. The theme includes a full e-commerce solution for making sales and accessed directly through the Calls-to-Action setup on the Landing Page. 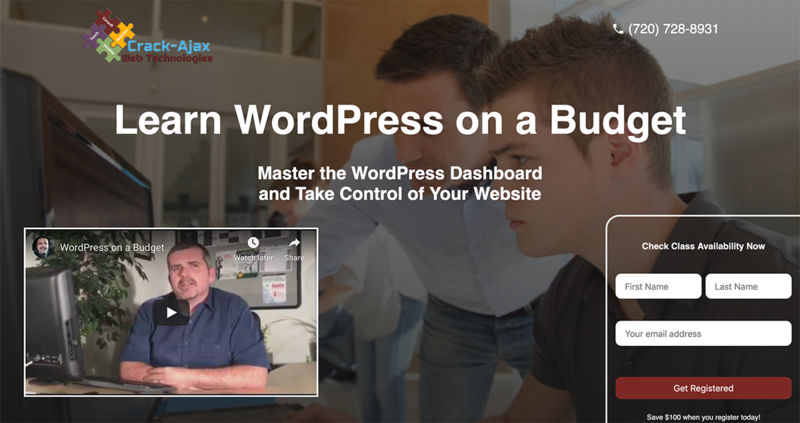 The site includes many settings accessed through the WordPress customizer for easy use and setup within the WordPress dashboard. A major East Coast advertising firm contracted Crack-Ajax to build a promotional site for Vote Haribo. They supplied the PSD art files and Crack-Ajax went to work to bring this ultra-modern design to life. The site features complex forms and on-the-fly PDF menu printing for promotional submissions by it’s customers. Rocky Mountain Fleet Compliance needed a website presence, but had a limited budget to work with. Crack-Ajax developed a custom website with a Content Management System and other features within the available client budget. Structured Plus Communications was the first customer for Crack-Ajax. This client returned to refresh to look of their site and make it more modern looking using the latest in web development technologies. Crack-Ajax delivered with a fresh look to match the client’s rebranding efforts using the latest in HTML5/CSS3 along with some interactive jQuery touches.